Developing your Willpower is easy – because everyone has it. The sheer fact of life means that you possess the Power of Will. Every single decision, every act is driven by your desire for more life. Now, of course, many of your actions and decisions or automatic. That is the nature of habit. And just like you have developed certain habits over the course of your life, you can develop new ones. In the last several years, for example, you have develop new habits with the way you use electronics. That’s because new tech knowledge he and new ways of interacting with media have been developed. Many of these feel natural because they were designed to work with your machinery. And as you consider these new habits, as well as ones you have develop your entire life, you know you can develop new ways of expressing your Willpower. You can also decide to concentrate on your Power of Will buy keeping track of your progress over the next month. 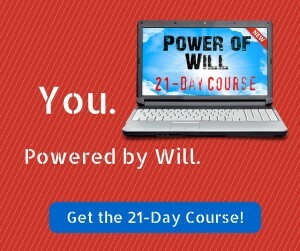 You can also decide to think about your Power of Will. You can spend the next several weeks simply contemplating you’re well – and building up your reserve of imaginative decision-making in order to create new, constructive habits. You can also decide to use the resources available to you – including modern electronics and the wells of opportunity they present to develop your Power of Will. You can develop your Willpower because you already have it. You are already using it. The results of your life are the evidence of your Power of Will. You can decide today to take command of your Willpower and direct it – into new habits, new actions and toward new goals to create new results. You can start simply by thinking about your Will. And you can continue, every day, by continuing to think about your will, making decisions and taking actions which get you the results that are the result of your conscious decisions. 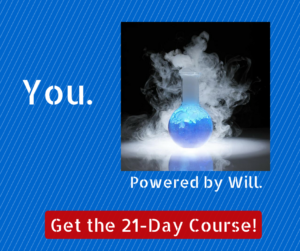 We hope you decide to develop your Power of Will by using the material we provide. 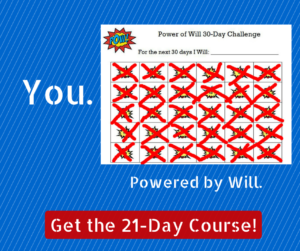 To gain access to the Power of Will 21 day course, 30-Day Challenge worksheet and 30-Day Planner, click here we hope to see you inside the member’s area. Good luck!